The City wants to remove Single-Family zoning language from our Neighborhood Plan to allow for upzones and increased building heights in our neighborhood. This Thursday, the City is having an Open House in which they want to “start a discussion” around changes to five neighborhood plans. If you think that neighborhoods should have a voice, and believe that residents, neighborhood businesses, schools and the city should all be involved and working together to plan the future – then wear black and attend the Open House. Show up, dressed in black as a visual protest of the City killing our Neighborhood Plans by controlling its language and not allowing neighborhood-directed planning. The City will ask you to rewrite a section of our neighborhood plan to remove single family zoning language and will dictate what language is allowable, or ask you to choose one of their options. Instead, we recommend you tell the City that our neighborhood plans and zoning should only be changed through a formal neighborhood planning process. Please join us for the “Funeral of the Neighborhood Voice”. 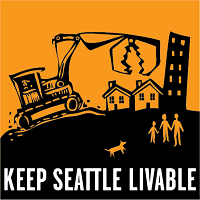 City’s October 26th Meeting Announcement: The Department of Neighborhoods set up two Open Houses, one last Tuesday in West Seattle, one this Thursday, in Fremont. The Open Houses have two topics: the Comprehensive Plan Amendments to Neighborhood Plans, and Scoping of the Accessory Dwelling Units (ADU) Environmental Impact Statement (EIS) concerning Backyard Cottages & In-Law Apartments. NOTE: The ADU EIS Scoping Comments are due November 1, 2017. This entry was posted in Backyard Cottages, Calls to Action, Land Use, Parking, Quality of Life, Schools, Shorelines, Transportation, WallHALA on October 26, 2017 by Frank Fay.